Commerce – especially ecommerce – is a numbers game. Merchants who want to run a top home based business must analyze their store stats frequently to tweak their stores for optimal performance. Number of visits versus number of conversions, best sellers, popular wish list items … this is all important information that can help merchants improve their stores. In this post we will look at 4 statistical tools that can be found in the InstanteStore ecommerce solution. You don’t need a custom shopping cart to have access to these statistics. The stats are easy to access and we hope owners of online business opportunity work from home busines will make use of them after reading this article. We have blogged about the importance of rewarding customers as well as visitors. Owners of any top home based business will tell you the same thing. 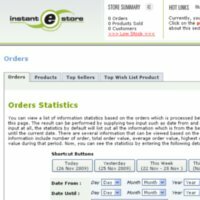 If you click on ‘Statistics -> Customers’ at your InstanteStore administrator control panel, you will be shown 2 lists of 10 customers each who have bought the most items and spent the most at your store. As a gesture of gratitude, you should definitely reward these good folks slightly more than you reward other customers. You can opt to give these top customers larger discounts or more reward points on their next couple of purchases, for example. You may also choose to waive shipping charges on their next purchase(s) if this makes sense. Statistics can also help you plan your inventory. By simply viewing the top sellers list, you can see which items have brought you the most in terms of revenue, quantity and profit. You can examine these items and see why they sell well. Could it be the price, the design, the material or the fact that the product was on sale? The answers to these questions will help you gauge your market needs and wants better. You can then plan sales, promotions and product selection more effectively. Products on a wish list are a clear indication of what products people would like from your store. It’s like a letter to Santa except that they can’t get these items for free. By analyzing the list, you should have an idea of which other items to promote. Maybe you could try including popular wish list items when you next put products on sale or tempt customers with special product-specific discount coupons for these items. This tool will help you understand how visitors find your store or product pages, and gives you an indication of how certain keywords relate to certain pages. The list is arranged chronologically which allows you to spot a keyword search trend if one exists. Top home based business are usually found very easily in searches for the keywords that they target. We hope you will use the tools we suggested to help improve your store. Please leave us a comment if you have any feedback or questions.